With just twenty days left for the Galaxy S9 and Galaxy S9+’ highly anticipated launch, we’re going to see a new leak almost every day if history is any indication. Recently, accessory retailer Mobile Fun gave us a glimpse of the official Clear View cases for the S9 and S9+, revealing that the new phones won’t be much different in size from their predecessors. Samsung’s new flagships are expected to launch with mostly the same cases and accessories as the S8 and S8+, and a leaked image is giving us a glimpse of at least two of those cases and the convertible fast wireless charger. 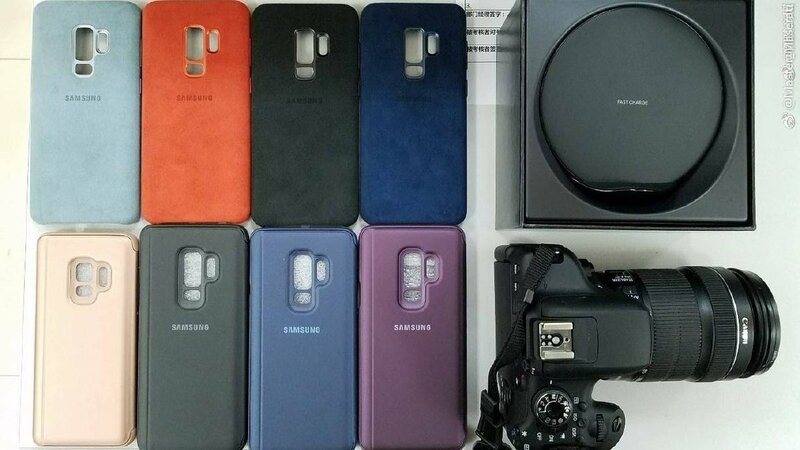 As you can see in the picture below, all but one of the cases are for the larger Galaxy S9+, with a cutout for the dual rear cameras standing out in stark contrast to the single-camera cutout for the regular S9. The pictured cases include the Alcantara case and what looks like the Clear View cover as seen in the previous leak. Also sitting next to the cases is Samsung’s convertible fast wireless charger. It’s probably the exact same model as the one that launched last year, though, and we’d have loved to have a look at the DeX Pad instead. And, before you ask, that camera in the picture isn’t an accessory for the Galaxy S9 and Galaxy S9+, but we’d wager it doesn’t cost much more than the S9 duo.